We had a great family night out on Tuesday! We went and saw The Harlem Globetrotters at Tullio Arena! This is the second time we’ve gone to see them and it was still funny. Last year we had awesome seats right up front but for some reason the seating chart was NOT right on the ticket site and the ones we ended up with this year were way way up in the stands — plus they cost more than the ones we bought last year! Oh well, it was still a good time (even if Super G. did drive around the block 3 times looking for a space and we ended up being 15 minutes late)! Pie got a new Basketball and we managed to wiggle our way into the lines to get two autographs, one from Firefly and one from Too Tall (the short one)! We couldn’t find Special K, that’s who she really was hoping to see but we can always try again next year! That is awesome! My 3 year old is a major bball fan already he would be jealous! Looks like a fun evening! My son has been asking to go so we need to check out schedules. Y hubby remembers seeing them as a kid and wants to take the boys. how fun! great shots with the players!! Fun! We saw them about 10 years ago in Pensacola. It’s a really neat experience. Glad your kiddos had fun. I’ve been to one game and it was one of the most entertaining nights ever! That wonderful that you all got out to enjoy the evening to watch the Harlem Globetrotters play is so cool. I’m glad your daughter got to get her basket ball sign! And that your son & girl-friend enjoy the evening also! This something you all will remember for a very long time! What fun, it is great you got the pictures! How cool! I’ve never been to see them but we’d love to! 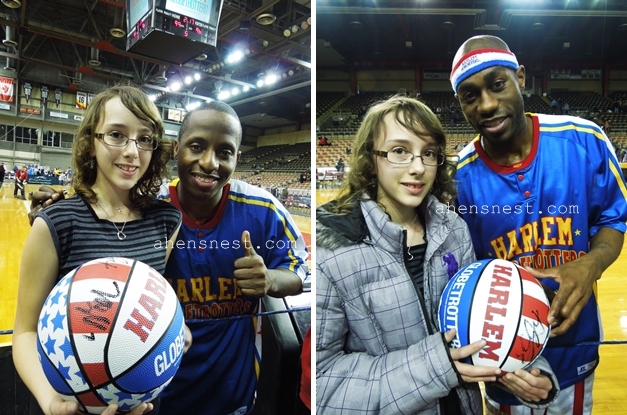 I love the Globetrotters, got to see them floor side seats about 3 years ago, one of my bucket list items! Previous Post: Great big list of Printable #Coupons 4.00 off Date Night 1.00 off M&M’s Pretzels and more!